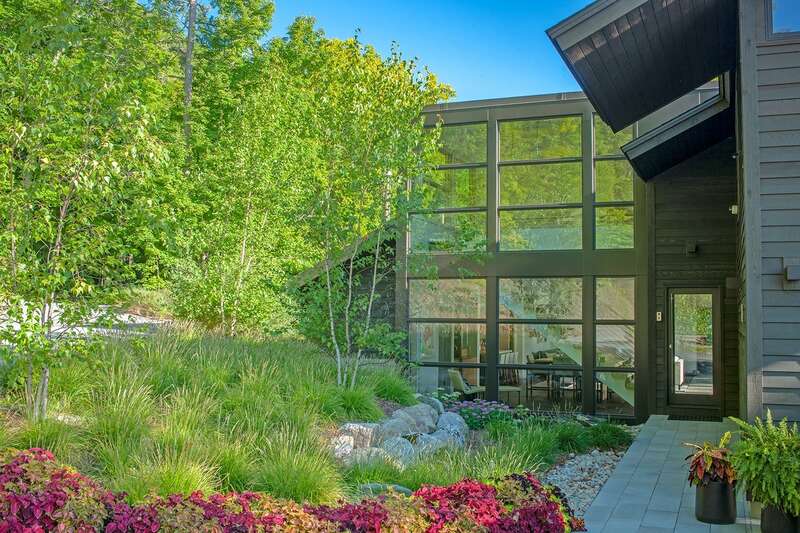 Architect Ken Richmond and engaged homeowners pull on age-old architectural principles to create a fresh take on waterside living in Northern Michigan. Ken Richmond and his wife, artist Joan Richmond, spend a lot of time in Italy. Ken’s passion for the country, which Joan shares, began with a couple of college abroads there years ago. Based in Rome, they’ve toured the entire country, including the renowned Amalfi Coast where villas nestled into the sides of the Lattari Mountain look over the cobalt waters of the Tyrrhenian Sea. 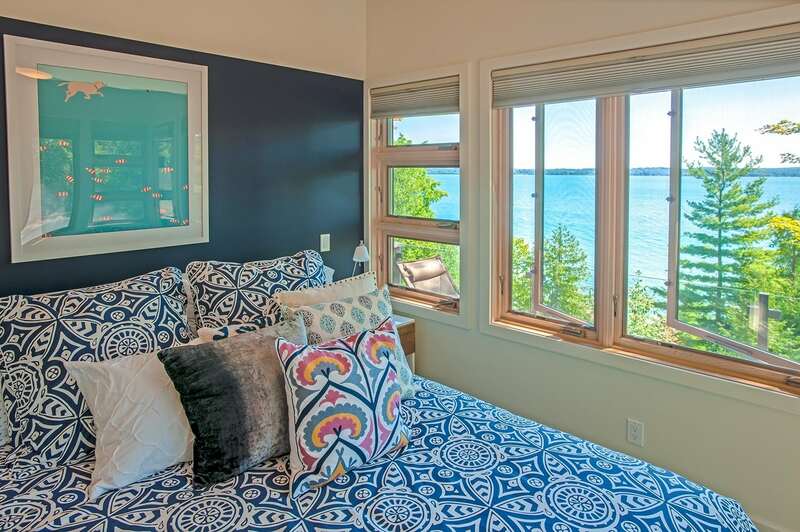 Which, I strongly suspect, is why, when standing on the porcelain-tiled terrace of this home overlooking the intensely blue, 19-mile-long Torch Lake, I felt as though I were in a villa. Not that Richmond, or the discerning homeowners, would ever desire a literal recreation of an Italian villa in Northern Michigan. 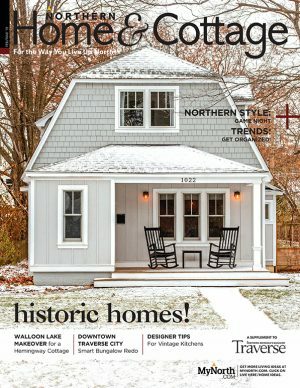 The homeowners imagined a contemporary rendition of an American lake house when they hired Richmond, who has made a reputation for his beautiful cottage designs—each distinct yet all evoking some sense of Northern Michigan lake-country vernacular architecture. But like the skilled and wise architect that he is, Richmond is guided by ancient principles: perhaps the foremost being to work with the land, not against it—a feat that is particularly difficult when the site is hard to build, as in a parcel with a steep slope on one side, and a road on the other. As in the case of much of the Amalfi Coast. As in the case of this Torch Lake lot. All too often, the modern fix is to scrape the site and create a plateau. Richmond chose the ancient solution: snuggling the roadside part of the house into the hill. “That side of the house is buried three feet, which makes the house look much smaller from the road and blend into the site … I love that,” Richmond says. A home snuggled into and strung out along an ancient hill with a terrace that overlooks a cobalt inland sea … you get where I am going. 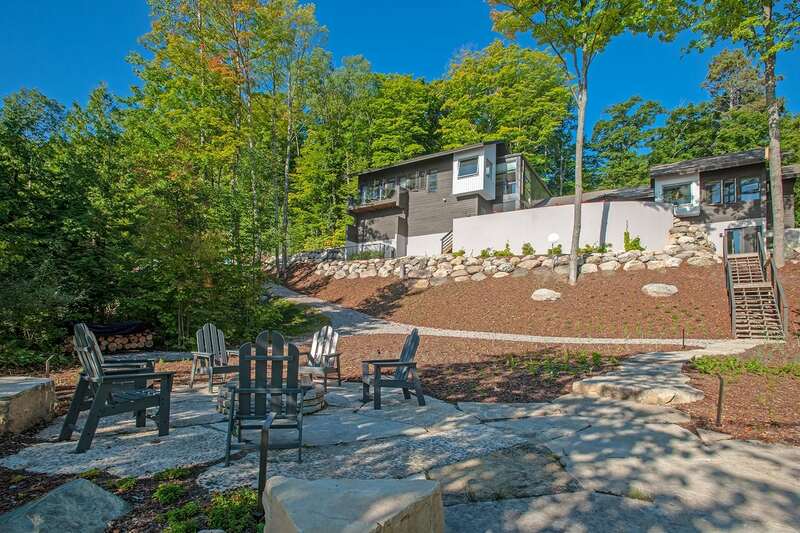 Being as conscious of the local vernacular as he is of the local topography, however, Richmond added exterior elements that reflect traditional Northern Michigan cottage design. The two wings attached to the “bridge” (which houses the great room) for example, don’t mirror each other—one is two-stories, the other is a single story to give the effect of an old structure that was added on to over the years. Dark stained, rough board and batten siding and deep eaves also help ground the structure in its Northern Michigan environment. That said, the home is anything but your grandmother’s cottage, as in the stunning and contemporary two-story grid of windows that flank the front door—an entry that is set on the side of the home away from the road—and that floods the great room with light. 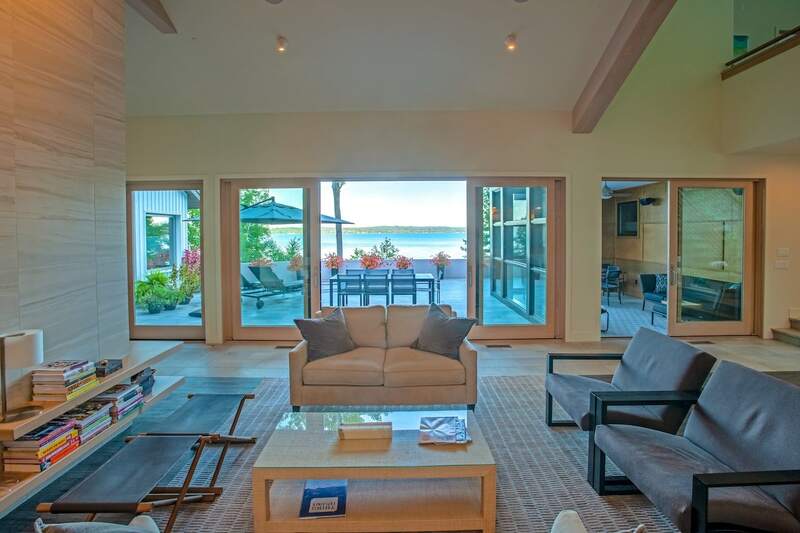 Likewise, light pours in from the wall-sized glass Nana door between the great room and that fabulous terrace and its incredible Torch Lake view. 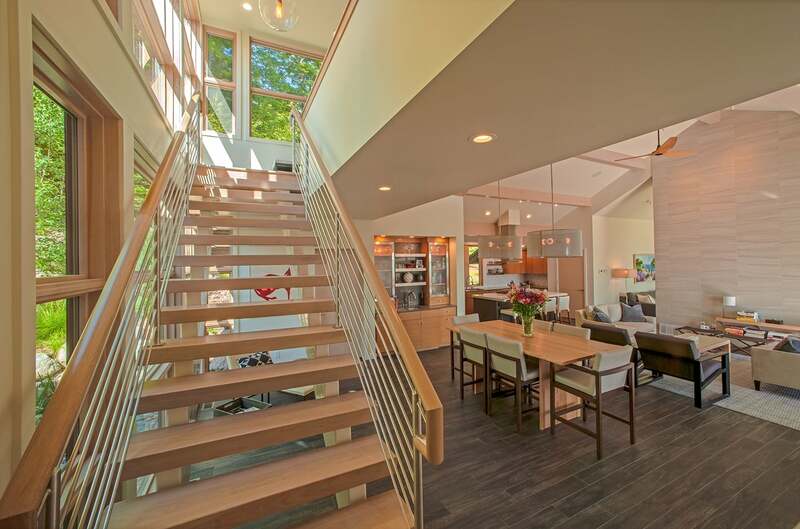 Richmond has filled this home with other smaller but significant touches including a sleek floating staircase that climbs to a floating bridge that leads to the adult children’s suite, windows that are set at purposeful angles to catch the gorgeous lengthwise views of Torch and several window niches that hover over the water like a ship’s berth. Structural engineer Angelo Vozza of Avanti Engineering worked with builder Roger Gribi to execute the design. 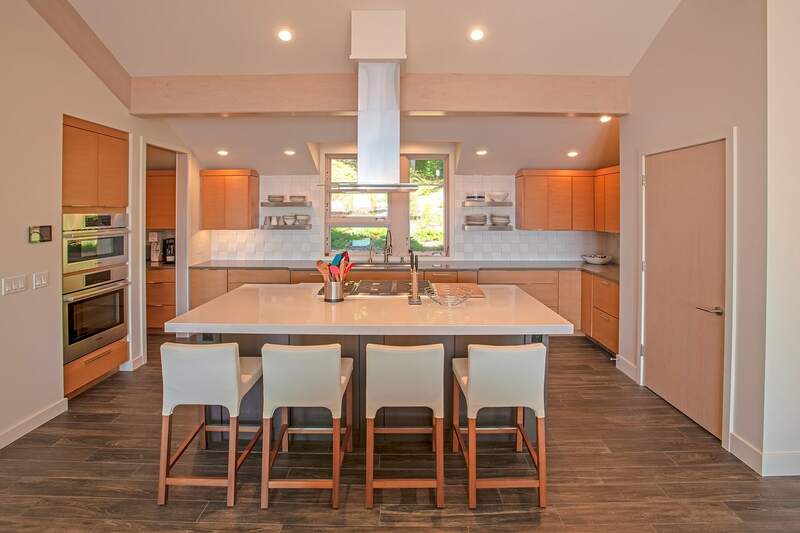 The homeowners captained the decisions on the interior finishes, working with Nowak Cabinets on minimalist modern-style kitchen cabinets in warm wood tones. They also chose to clad the floor, fireplace chimney and face in a coordinated porcelain tile that flows out on to that terrace—and feels like a contemporary take on marble. 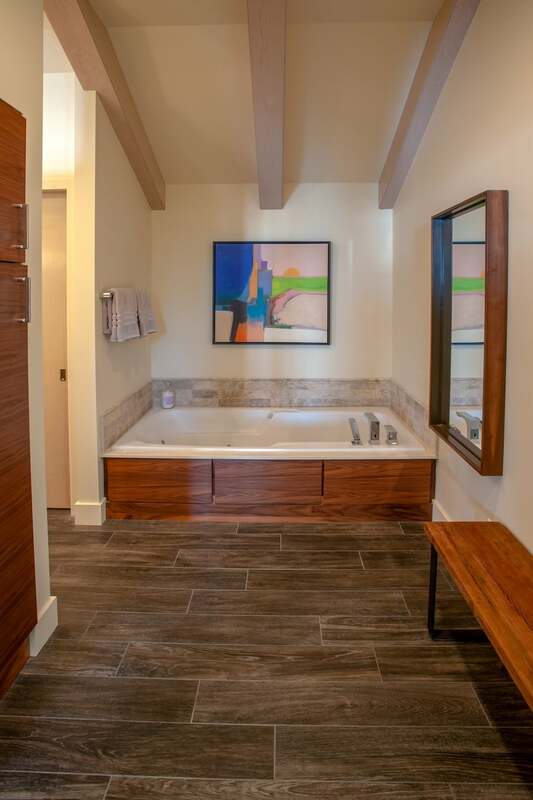 After two summers spent in their home, the homeowners understand that their architect designed them a home for the ages: classic yet contemporary; organic yet fresh and light as a new day. “We just love it,” says the homeowner.